Somewhat of the story of my life. I was born in Massachusetts, USA. I grew up in a family of seven, including my parents. I was the youngest of 5 children. Some of the fun things we did were visiting the beach, the mountains in New Hampshire, and visiting relatives. We used to have family cook-outs quite often in our back yard and those were fun too! 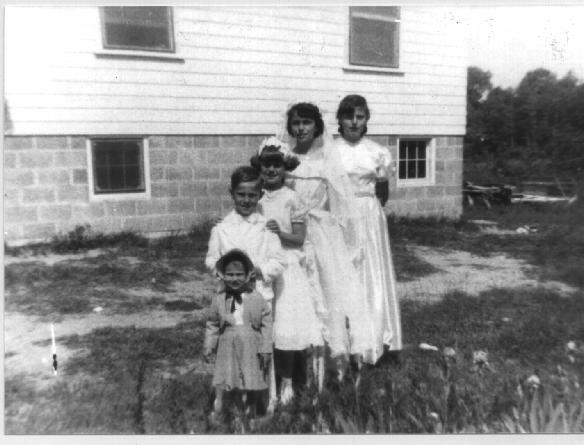 In the photo to the right/above I am the baby with my brother and three sisters. Massachusetts is a beautiful place indeed, but because of the cold winters I wanted to move away, and I did! I started practicing Transcendental Meditation in the Fall of 1974. I got married in 1977 in Massachusetts to Bert, who I met while being a part of the TM group (see below). He's from California. Most of the moves my husband and I made were with the Transcendental Meditation (TM) organization. We felt that the TM group and being a part of it would help us and help the world attain world peace. To read more about TM, click on the links below and other links on those pages. We are no longer part of the TM group. We still do occasionally meditate, but not often. I have lived in many places in the U.S.A. I lived the first years of my life in Massachusetts, of course. I lived for a while in upstate New York in 1976 and 1977. 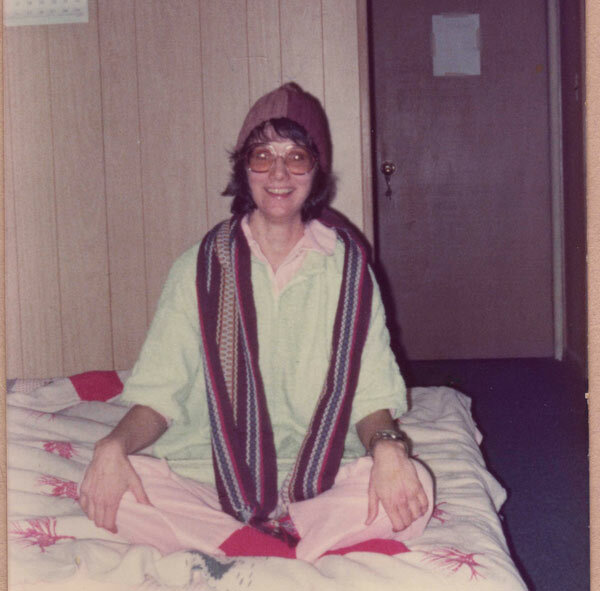 That's me in the photo to the left/above sitting on my bed at the Science of Creative Intelligence retreat center in upstate New York in 1976. My husband and I moved to California in 1978, then to Nevada for a bit, and back to California, Then to Missouri for a year and a half and back to California. My husband and I had a beautiful daughter in 1981 in California! 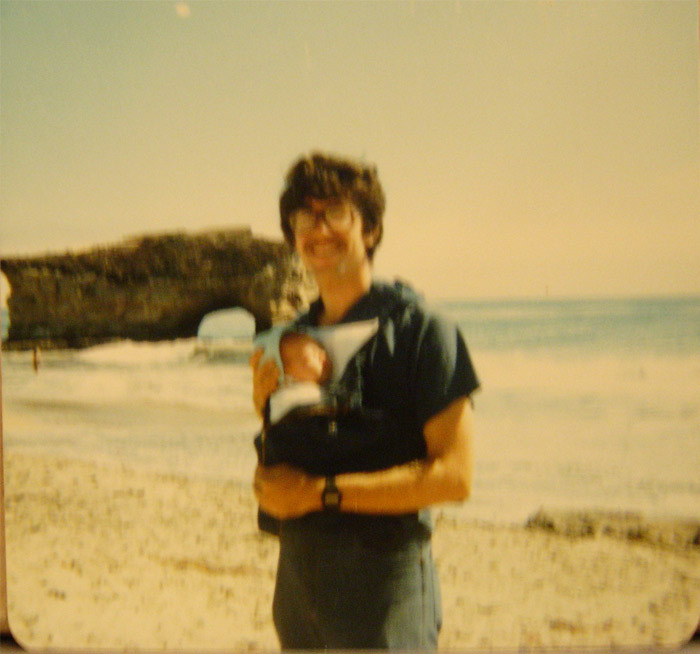 To the left/above is Bert and baby Erica at Carmel Beach in California. We only had the one child, our darling daughter, who is grown up and is now living in California. She was born in California, but because we moved to Iowa when she was only a few months old, all she knew growing up was Iowa. We moved to Iowa in 1982 and lived there for 15 years. Our daughter grew up with us there in a little house that we bought. 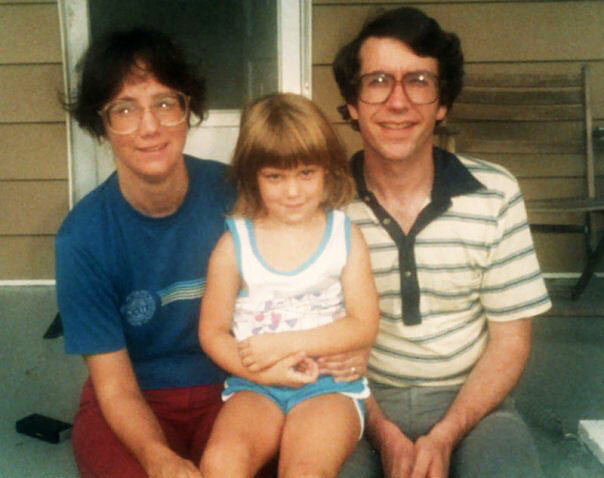 To the right/above is me, Erica and Bert sitting on the porch of our house in Fairfield, Iowa in 1985-ish. We sold our house in Iowa and moved to New Mexico, at the urging of a friend, in 1997, when my daughter was 16. I left my husband of 22 years in 1999. My daughter and I moved back to Iowa in 1999. My husband and I were divorced in 2000. I left Iowa at the very end of 2001 and moved back here to New Mexico where I now live. My daughter moved from Iowa to the Los Angeles, California area at the end of 2002 and she is still there. She loves living there! I miss her bunches! I visited her for two weeks at the beginning of 2006. She visited us here in New Mexico in September of 2014 and again in May of 2017. We had a GREAT time! We took her to many places around here. See pictures in my Instagram and Facebook accounts. We text each other quite often. We send each other photos as well and even talk on the phone on occasion. Bert and I moved back together, here in Taos, at the end of 2005. Everything is great! I love playing and working on the Internet and on my cell phone and laptop! I am now remarried to Bert, the man I married in 1977. 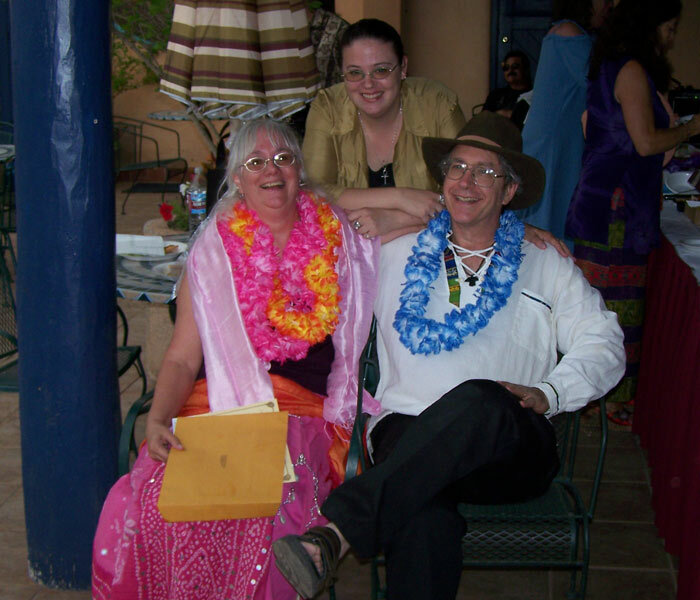 We were remarried in a simple ceremony here in Taos on June 22, 2008. Erica came for the event and so did my brother Richard and his wife and one of my sisters, Arline, and her husband. It was a very nice wedding. Click Here to see the video I made of the wedding on Youtube. To the left/above is Me, Erica and Bert at the wedding. See pictures of the wedding: go to My Facebook Account, go to my photo albums and find the one called Our Weddings - 1977 & 2008. We have lived in many places in the U.S.A. including Massachusetts, New York state, California, Nevada, Missouri, Iowa and New Mexico. We lived in Iowa for about 16 years. I plan to spend the rest of my life here in New Mexico. I have never left the U.S.A., unless you count a trip into Canada for a few hours when I was about 20 and a very brief trip through a small portion of Canada when I was about 16. From 2003 until 2006 I took Celtic shamanism classes. These include some trance and journeying practices. I've also, in the past, read some books about the power of prayer, positive affirmations, other types of meditations, Shamanic journeying and magic work. I started attending The University of New Mexico - Taos in the fall of 2002. I never attended college before in my younger days. It was fun and I learned a lot about myself! I learned that I'm quite smart! I also worked as a work-study student at the UNM-Taos Library from 2004 to the beginning of 2008. I was very slow to learn in grammar school and in high school. I had a hard time with spelling, math and any kind of sports. I was extremely shy in school but I learned lately to be not so shy any more. I am no longer attending college. I will probably take some classes in the future, but not now. I started working at the same UNM-Taos library in March of 2014. That's the same place I did student work-study work mentioned above. I liked it there. It was a "real" job and I made a per-hour salary. But... I quit this job on May 2 of 2016. I'm retired. I worked there for 2 years and 2 months. Sure, I liked the job but it got to be too much and I was ready to retire. I enjoyed working there but I quit when I turned 65. Now I'm retired and enjoying life. To the left/above is a photo I took of the Klauer campus in winter of 2014 or 2015. Life goes on and on. And I never know what I will do next. I say I am a 20 year old in a sixty-something body. I don't ever want to grow up! I love music of most kinds. I usually say I won't listen to Jazz. I sometimes listen to Country music, particularly if we watch the Country Music Awards. I even listen to some of the new stuff - even occasionally Hip Hop and a bit of Rap. In the past I was self-employed building web sites and other types of computer work. I'm not doing that any more. I quit all my clients at the beginning of 2018 and I'm not taking any more new clients. Like I said above, I am retired. I feel that life is what you make of it and I believe in keeping a positive attitude. Since 2010 Bert and I have been living in a little cabin-like house totally off the grid out in the middle of nowhere about 30-40 minutes from Taos, NM. 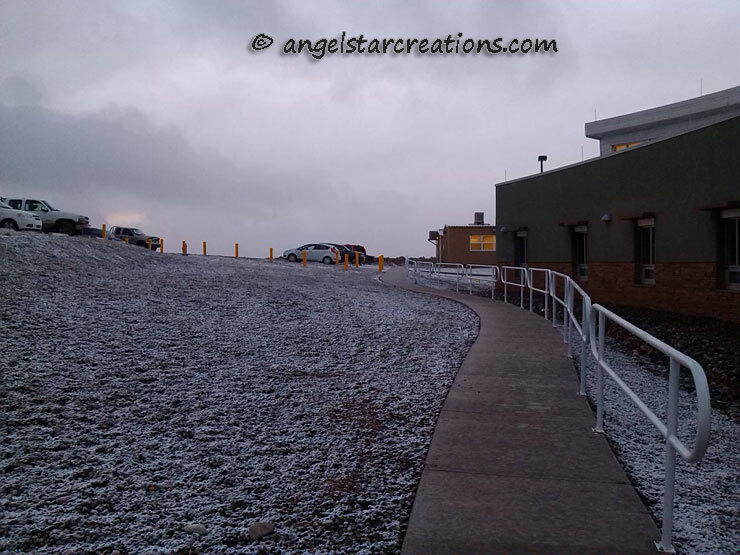 It's lovely, quiet, and we see beautiful sunrises and sunsets and the endless scenery! If you want to see more pictures you'll have to check out my FaceBook account. If you would like to know more about me read my ramblings elsewhere and check out my other Sites & Pages on my "All Site Links" Page.